Scallops, and other bivalves, found in Big Lagoon. Bay scallop (Argopecten irradians) were once common along the entire Gulf coast of Florida and portions of the Atlantic coast along southeast Florida. A combination of habitat loss, poor water quality, and over harvesting reduced their populations to where the commercial harvest was banned, and recreational harvest restricted to a specific season and to specific areas where populations remain healthy enough to support it. There has been research and discussion as to why scallop populations declined, and whether they can be restored in Florida waters. The Florida Fish and Wildlife Conservation Commission is interested in scallop restoration. Portions of Pensacola Bay historically supported scallops and is a possible target for a restoration project. Conversation with residents who remember, and personal experience, indicates that populations existed in both Santa Rosa Sound and Big Lagoon. The method used for this survey is the same that Florida Sea Grant Agents are using in Lee and Charlotte counties in southwest Florida. 1-nautical mile square grids are mapped out in each body of water with the assistance of the Florida Fish and Wildlife Conservation Commission (FWC). Citizen volunteers are trained by Sea Grant Agents on the methods of setting up, swimming, and counting scallop along a 50 meter transect line. Teams of 3-5 trained volunteers are assigned one grid and are asked to conduct four 50-m transects within that grid. The number scallop, scallop shells, bottom type, amount of epiphytic macro-algae, and observed marine organisms are logged on a data sheet. For the Pensacola Bay survey, we included manatee grass (not as common locally), horseshoe crab and lionfish. Volunteers returned data sheets to Sea Grant Agents at assigned boat ramps. This year due to excessive rain events, Sea Grant trained volunteers prior to June 2018 and asked the volunteers to conduct their surveys before the end of August 2018. At that time they would return their equipment and data sheets to the Sea Grant Agent responsible for that body of water. The number of volunteers increased from 5 in 2017 to 20 this year. This is aligns more with the number who surveyed Big Lagoon in 2015 and 2016. Due to rain events, we trained the volunteers in May and had them survey their grids when the weather window was good. We asked them to return their equipment and data sheets by the end of the August. 7 of the 11 grids (63%) were surveyed. One team surveyed at location west of the marked grids – a grid we labeled “0”. This was Kees Bayou on the north shore if the Intracoastal Waterway between Big Lagoon and Perdido Bay. All transects within grid #0 (Kees Bayou) had 100% seagrass coverage; it was all Halodule. Grid #1 (located near the kayak launch at Johnsons Beach at Gulf Islands National Seashore) had one transect with a hard sediment and <5% seagrass coverage. Grid #3 (just north of Big Lagoon State Park) only had 25-25% seagrass coverage. All other grids had a mix of Thalassia and Halodule with 70-100% seagrass coverage. Of the 32 transects surveyed this year, 17 (53%) had 100% seagrass coverage. Another 6 had 75% coverage for a total of 23 of 32 (72%) transects with 70% of more seagrass coverage. 4 of the 8 grids (50%) surveyed this year had macroalgae. This falls in line with the number of grids having macroalgae in 2015 and 2017. Only 28% of the grids had macroalgae in 2016. Eight grids were surveyed and four 50-m transects were surveyed within each grid; for a total of 3200 m2 surveyed. NO LIVE SCALLOPS WERE FOUND. Since the project began in 2015, 124 50-m transects have been surveyed in Big Lagoon (12,400 m2) – only one live scallop has been found in that time (in grid #11 in 2016). The frequency of occurrence in Big Lagoon is < 1%. However, SCALLOP SHELLS are found more frequently (30% of the grids surveyed) and increased in frequency this year (63% occurrence). 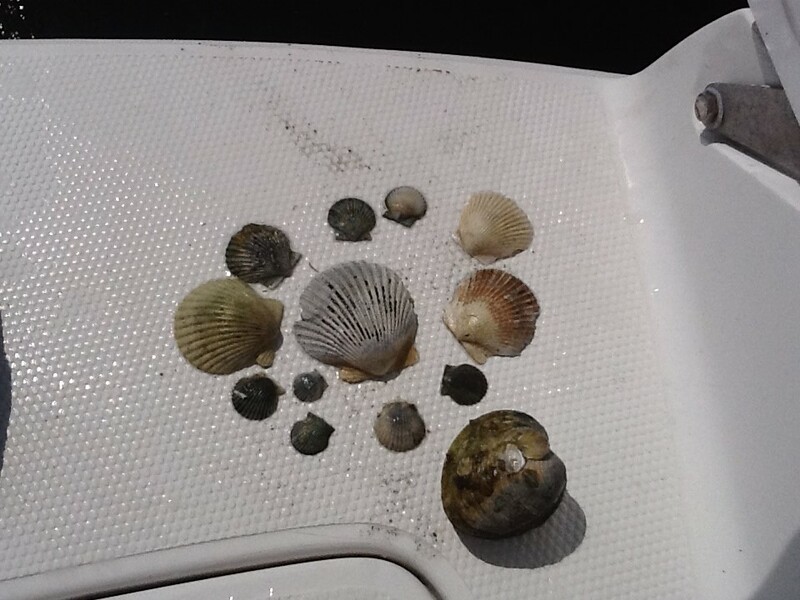 All scallop shells were found along the south shore within the National Seashore and 24 shells were found in grid #11 (Ft. McRee); where the only live scallop was found in 2016. Rick is the Sea Grant Extension Agent for Escambia County. His programs include topics on coastal invasive and nuisance species, restoring habitat and fisheries, monitoring water quality and biological indicators, and enhancing marine literacy for the community.